To the surprise of even myself, I am still staying away from processed carbs like pasta, rice and bread. It is over six weeks since I have consumed any and the most amazing thing about it is I don’t actually crave to eat any of it either! The rest of the family are still eating pasta, rice and bread, albeit in much lower quantities. 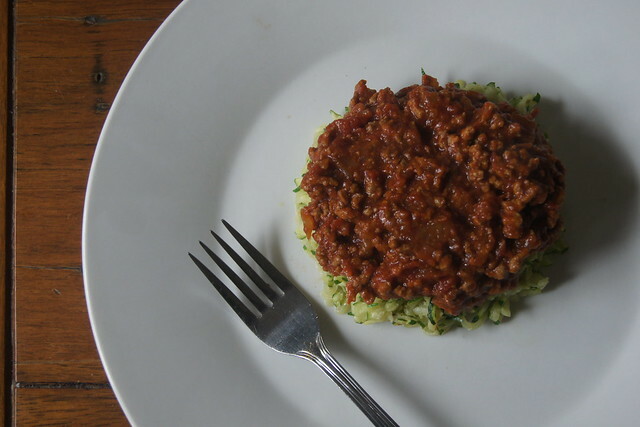 Meals like spaghetti bolognese will still be appearing on our family menu plan. I am trying where possible to only cook one main meal, but sometimes it means having a different side dish or accompaniment. In the case of spaghetti bolognese I finally gave zucchini bolognese a try. I had scoffed at such recipes previously, when I saw them on my pinterest feed and thought there was no way it could be any good. I was however very wrong. Of course it tastes nothing like pasta, so don’t expect that! But with a dash of olive oil and garlic, the zucchini has fab flavour and it tastes great with a rich tomatoey bolognese sauce. I have included the slightly altered “cleaner” version of my slow cooker bolognese in the recipe below. The family noticed no difference at all with the new version of the bolognese sauce! Heat 1 tbsp oil in a large frying pan on a medium heat. Add chopped onion and 1 clove of garlic and fry for a couple of minutes, until soft. Add mince and be sure to break up the mince thoroughly as it cooks. Pour this mixture into the slow cooker. Add tomatoes, tomato paste and salt to the slow cooker. Using a spoon combine well. Put lid on and cook for 6-7 hours on low or 3-4 hours on high. About 15 minutes before you want to serve, grate the zucchini. Or if you have a fancy julienne machine, use that to make lovely long thin strips of zucchini. Add 2 tbsps olive oil to a pan on medium heat. Crush the garlic cloves into the pan and toss it for a minute or so, then add the zucchini and toss it for 3 - 4 minutes. 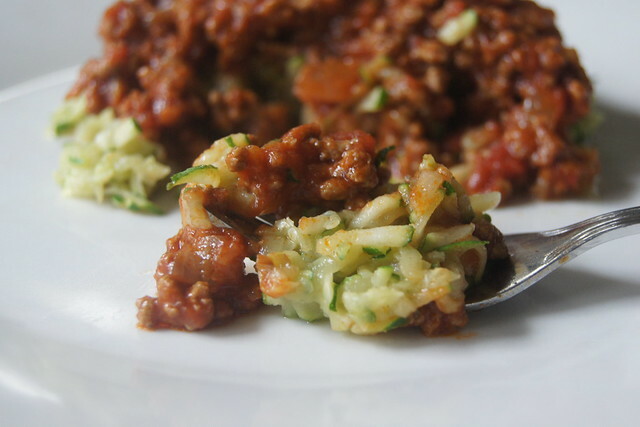 Place zucchini on to plates, top with bolognese sauce and serve immediately. If the zucchinis are small, you may need to allocate 1.5 per person.